It’s no secret that people love bullet journals. And if you think that bullet journaling is not your cup of tea, then I’d say give it a try! It’s so addictive that if you try the basics, you’ll definitely look for more creative ways to customize your journal. Also, the new year is about to knock on our door, so this is the best time to give it a try. And I’ve found some creative and useful bullet journal hacks to help you get started with getting organized for the new year. So check them out and let me know what you think! Dutch doors are one of the best bullet journal hacks out there. First of all, it’s super easy to create and second it’ll create more space for your weekly spreads. All you have to do is cut a page into half. Then use it in between two pages. You can track your habits and goals for a more extended period with an annual tracker. 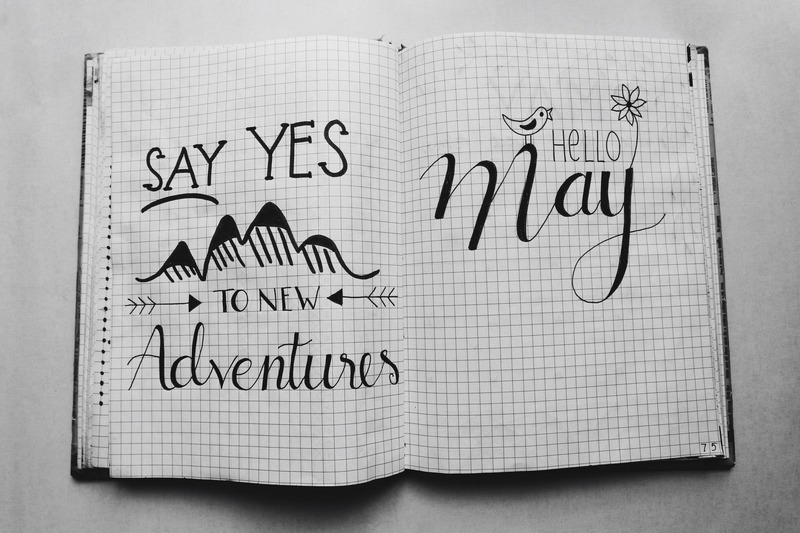 Write all the months and the dates on a particular page(s). When you successfully achieve a goal you can cross it out. For example, if your goal is to lose 5 pounds in July, then cross it off after achieving it. You’ll feel motivated when you see things getting knocked off! This one is a brilliant idea that’ll help you keep track of all your categories. Write down all the sections like “Health” or “Finances” on one of the first pages and give each one a color of its own. Then you’ll be able to know if you already have a certain section in your journal for a certain topic and not forget. Washi tape can customize your bullet journal and give you a cute look. You can separate your sections by using washi tape. These sections can include goals, events, and tasks. Washi tape is also available on Amazon at a reasonable price. Zebra Mildliners are extremely useful for making great color codes, (these are also available on Amazon as well). For example, you can simply color the edges of the corner of a page to define different categories. You can even use a color for matching the index. So for example, pink can represent notes while yellow can represent monthly spreads, etc. Stamps will not only help you make your bullet journal look amazing but also save your time. This is also one of the best options for date stamping. You can grab an envelope, but it has to be cute! Then use washi tape and put it inside the bullet journal cover. You can store all your magazine cuttings, tickets, coupons, and other things here. Bullet journals are such a great way to stay organized in the new year (or any time of the year really!). It’ll help keep your finances in order, help you to reach weight loss goals, and keep your home organized. Definitely try it out this year! Now if you have any question about bullet journal ideas, just let me know in the comments down below. I’d love to help you out!